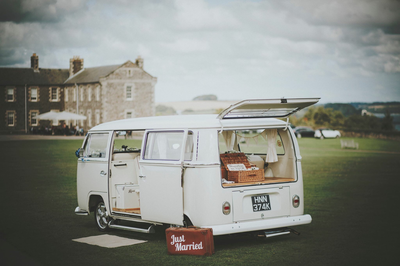 Welcome to Honey Bugs VW Wedding Car hire, home to beautiful VW campers in Cornwall. Honey Bugs is based near Newquay, but we are happy to travel throughout Cornwall to provide happy couples with classic vintage transport for their special day. Our beautifully restored classic Volkswagen vehicles are the perfect wedding car for any Cornwall based wedding. Honey Bugs prides itself on providing a friendly, relaxed and professional service. Our wedding transport packages can be tailored to suit your requirements and we are always happy to listen to any individual requests. We want your special journey with us to leave you with smiles and lifelong happy memories.